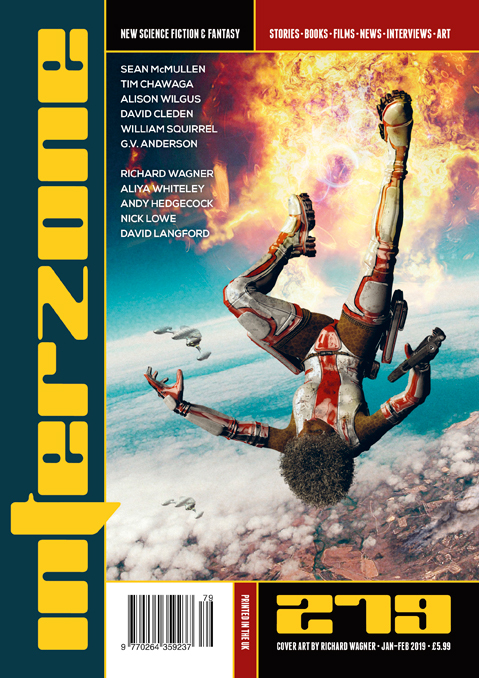 "Terminalia," by Sean McMullen [bio] (edited by Andy Cox), appeared in Interzone issue 279, published on January 1, 2019 by TTA Press. Pro: The natural order has been unbalanced by Duncan’s invention of metal bodies that can hold the souls of dead people. Lucielle’s visit to chat with Death restores the balance, at least in part. There's a a reasonable amount of tension when we wonder whether Lucille is dead or not. Con: It’s all too easy. Jules resurrects Lucielle after just one trip to see Death, and that largely solves the problem. Duncan’s obsession over Valentina is anticlimactic. In both cases, Jules is a passive participant at most.